High quality Apple watch case protects your Apple watch from scratches, bumps and other daily damage. This case cover 0.5mm thickness, slim and lightweight to add minimal bulky. High-Quality Materials: Electroplating craft is applied to make your watch looks shiny and elegant. High quality PC material stable , also lightweight to cause no bulk to your iwatch. 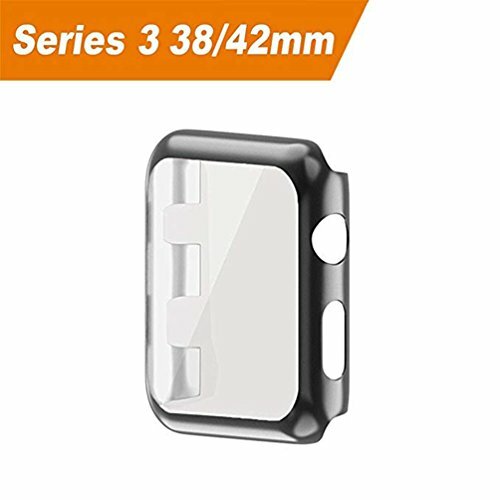 Ultra Thin: The case is only 0.5mm and it can fit your apple watch series 3, perfectly and keep high touch sensitivity. Easy Access And Press Buttons: Fits seamlessly with your phone, you get easy access to the screen, power button, the digital crown and the speaker. Anti-Scratch : Full coverage screen protector make it strong protect your iwatch. Front raised edges recess your screen to protect it when placed face down. If you have any questions about this product by Hayder, contact us by completing and submitting the form below. If you are looking for a specif part number, please include it with your message.